Thinking snow?? 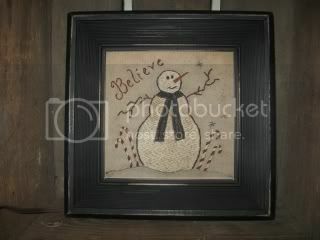 This snowman turned out so cute, an adorable little winter design that simply reads "Believe". I have stitched candy canes and some scattered snowflakes. 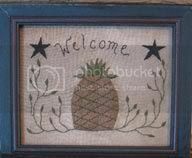 I used a black distressed square frame that the stitchery sits down in. The measurements are 9x9. There is glass and a sawtooth hanger. I did my stitching on coffee dyed osnaburg. This one of a kind will come signed, dated and copyright 2010. A perfect piece for the snowman collector! 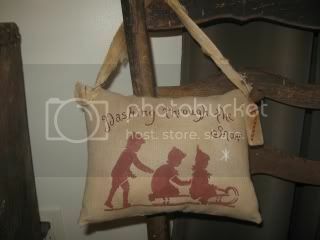 Here is another fun "Stitched, Stenciled and Stuffed" hanging pillow that I designed for the Holidays. I did my stitching and stenciling on coffee dyed osnaburg. It's stitched in barn red and reads "Dashing Through The Snow". Children riding a sled was stenciled in barn red. 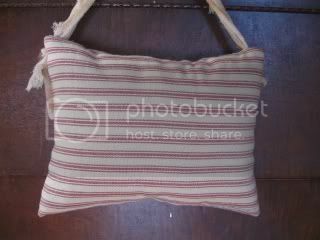 I backed the pillow with red ticking and filled it with polyfil. I attached coffee dyed cheese cloth strips by rusty safety pins for the hanger. A rusty bell and a candy cane hang tag are tied in the one corner. 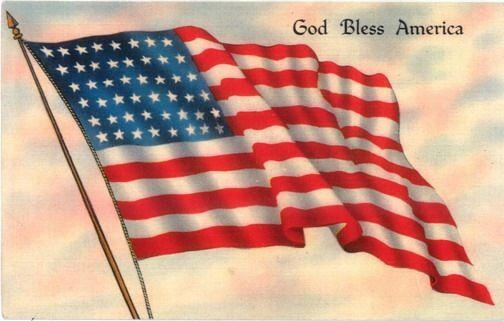 The measurements are 9 1/2" w x 7 1/2" L. It will come signed, dated, and copyright 2010 on the back. Well I am back in the stitching mode again! So many of you have been asking about my stitcherys and samplers so I made up two this week. 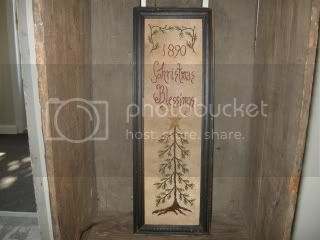 This one is for a tall Christmas Pine with "1890 Christmas Blessings" at the top. I accented the corners with some evergreen boughs. It was stitched on osnaburg and then coffee dyed for a primitive look. The frame is antique, I love the narrow size. These skinny ones are getting harder and harder to come by. I left the frame untouched, there is glass, and an attached rope for hanging. Measurements are 5'w x 15"l. This piece will come signed, dated, and copyright 2010 on the back. A nice touch to your Holiday decorating. Pam Bostwick!!! Congratulations! I'll be sending you off an email.